For a large majority of people lizards are a source of fear, disgust and a lot annoyance. These creepy creatures stay in the corners of your house and spring up on you out of nowhere. While they do keep the house free of mosquitoes, spiders and other pests out they are just really an unwelcoming sight when you are getting ready to sleep or eating your dinner. Lizards do not bite humans and actually run away from human contact but nonetheless, having them inside your house is just fun. Small lizards are common household pests, found in areas with a lot of vegetation. They often enter the house in search of prey as mosquitoes are attracted to lights inside the house. 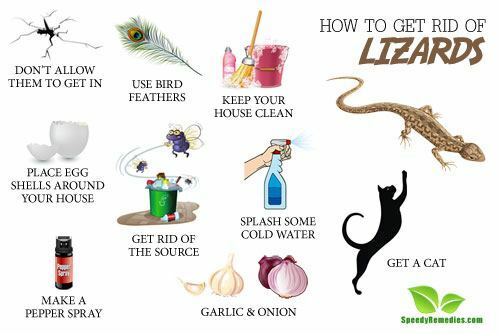 Since any benefit that they have to offer is far outweighed by your disgust and fear of them, we have compiled a list of methods and remedies that you can use to keep lizards out of your house. Lizards, by nature, do not infest households like other pests. They mostly live outdoors and only come in your house in search of food. When there are a lot of mosquitoes and other insects in your house, the lizards are bound to come. To get rid of the lizards, you need to get rid of the reason they come in. Once you eliminate insects and other bugs from your house, you will see a drastic fall in lizard appearances in your house. You can use bug repelling sprays and insecticides to get rid of insects. Don’t turn on your outdoor lights unnecessarily as it attracts mosquitoes; if you must use one, go for a yellow lights or sodium vapour lights. Also, avoid leaving the front door open during evening and night time, or use a mesh door to keep the bugs out while letting air come in. You have to make your inhospitable for the lizard, as well as other pests. And no, just projecting your hatred on them won’t work because they cannot sense your emotions; so you’ll have to do some real work about that. Keeping your house clean is a very basic way to make it unwelcoming for pests. Usually, people clean the surface area of the house, i.e. the area most visible and leave it at that. But food crumbs get into places that you don’t often clean such as behind the cupboards, under the bed, underneath the sofa cushion, the insides of kitchen cabinets and others. These crumbs coupled with darkness and sometimes dampness make a perfect hiding spot for lizards as well as other pests like rodents or rats. It is important that you thoroughly clean your house at least once a week. The unhygienic environment also attracts mosquitoes, spiders and other bugs which in turn attract lizards in search of food. To prevent bugs and pests from infesting your house, take care of how clean the house is. Don’t let the damp settle anywhere – keep it dry and clean. Fold away the pile clothes lying in your bedroom. Avoid hanging too many pictures as lizards like to hide behind them. Keep your furniture at least 6 inches away from the wall to provide for easy cleaning and no dark hidden corners. Keep naphthalene balls in you storage boxes or cupboards if you don’t use it much. Fix any leaky faucets or pipes as it causes dampness. Turn down the heat as often as possible, as much as you can. Lizards like warmth and the coldness will probably drive them out. Lizards can get in through small cracks or crawl under the doors by squishing their body. You need to set up fortification to prevent them from coming in. Firstly, don’t leave your front door or windows around the house open all the time, especially in the evening. The light inside the house attracts mosquitoes which attract lizards and before you know it, you have a disgusting creature living in your house full time. If you need to open the door and windows for ventilation or just because of the view, install a mesh or net door or a screen. These doors allow air to come in and go out, give you access to the view and keep bugs and pests out. Check the exteriors of your house and look for any cracks and holes. Fill spaces with some calk, fix holes in screens and repair openings around doors. Place mothballs around your windows as lizards don’t like their smell. An effective and economical method, the idea of placing egg shells around the house has been passed on from generations. It is a traditional remedy that your grandparents would have probably used to send lizards out of the house and keep them there. Lizards hate the smell of eggs and are also afraid of them as they think them to be predator eggs (birds eat lizards). Keep the shells in the holes in your walls, behind furniture – basically any dark hiding place. Keep them hidden as they might seem weird to your visitors if the shells are just strewn around in the house. It is advisable to replace the egg shells every 5 -6 weeks. You can use eggs of any poultry bird but go for the ones you like as this way you can also enjoy the nutritional benefits of egg while keeping the lizards away. Birds prey on lizards so it’s no surprise that lizards are afraid of birds. While you can get a bird if you want to (you’d have to let it go loose around the house so maybe don’t), using bird feathers is just as effective. Get a cluster of feathers, either order online or buy them from a pet shop. Arrange them together and put in a place of height, away from the reach of children and pets. The sight of feathers scares the lizards away. Place them in areas where lizards often frequent. Use tapes to stick them to the wall or put them in a vase like holder that is hung in the wall or kept at a height. While you can use feathers of any bird, peacock feathers are recommended since they also provide an enhanced aesthetic look of the house. Both can be used separately and in combination. The smells of onion and garlic are repugnant to lizards and they don’t go in area where the smell of either of them is prevalent. Hang around 6 – 7 garlic cloves around your house, especially near doors and windows to prevent them from coming in. You can also place some in the corners of the house. Cut some onions and place the slices near doors, windows and other entrances. Or else, keep them in the areas encroached by the lizards. The lizards will soon go away. You can also combine the effectiveness of both onion and garlic by making spray water. Grind together onion and garlic in equal quantities and mix some water in it. Pour down this mixture in a spray bottle. Now spray around the house and in the corners to keep the lizards away. Instead of buying one available in the markets, you can make your own pepper spray at minimal cost. Pepper has loads of benefits and this one of them. Just mix together 2 teaspoons of ground black pepper, 1 ½ teaspoon of red chili powder and water. Put the mixture in a spray bottle and spray it in the area where lizards are often seen. You might want to avoid going in that area for some time. Alternatively, you can use a Tabasco chili sauce and mix it with water. Use the mixture to spray away lizards. The odor of spicy sprays is repugnant to lizards, which is why you won’t find them lurking around once you spray. Mixing coffee powder and tobacco to make it into tiny balls is a lethal way of getting rid of lizards. Mix equal amounts of coffee powder and tobacco and add a little water to stick them together into a small ball. Place these balls behind cupboards, under the bed, in the holes and cracks on your walls. Lizards will eat them up and die. All you have to do now is to get rid of the dead bodies with care. Pick them up wearing gloves and wrap them in a paper or use a broom to sweep it in a box. Now close the lids of the box and throw it away from your house. Cats are cute, fluffy little pets with nice fur to pet and cuddle them. They are also vivacious hunters. Cats are good not only at hunting mice but also lizards, cockroaches and other bugs. While all cats have a hunting nature, some of them don’t hunt because they are too domesticated or just plain lazy. When adopting a cat, take a toy with you. Dangle it in front of the cats and see which ones go for it immediately and keep concentrating on it. These are the ones you want to adopt. But getting a pet just for getting rid of lizards is not a practical idea. Once you adopt a pet, there are certain responsibilities that come with it. Make sure you are ready to take in a pet. While you might know naphthalene balls as an effective way to keep away small bugs and insects, they can help with keeping away lizards. Put some balls in your cupboards and shelves. The smell of naphthalene balls repels these slimy creatures and therefore, they tend to stay away from places where these balls are kept. Make sure to keep it away from the reach of pets and children as they can swallow these balls, which is harmful for their health. Lizards are extremely sensitive to temperature. When you see a lizard, splash some ice cold water on it. The sudden change in temperature will shock the lizard and make it immobile. While the lizard is in shock and unable to move, use a broom to bring down the lizard and sweep it in a box. Throw the box away. This method is more of an on the spot remedy rather than something you have to prepare.Keep a bottle of cold water in handy near the area where you often see lizards and splash it on them. Mouse traps are a great way to catch some mice. Turns out, they are also effective for lizards.Place the traps in areas where lizards frequent and leave it there. You can also place them at the entrances, but be careful to keep away pets and children. Soon, you’ll have a dead lizard to throw away.